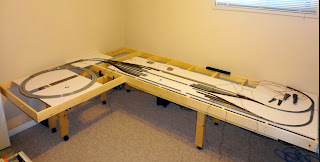 Laying out the tracks onto the Gatorboard sub-roadbed. 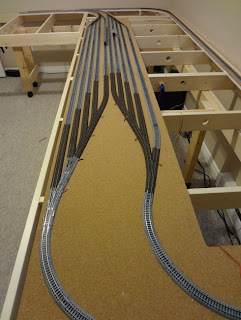 Once the staging yard plans were finalized, it was time to get started on laying some track! 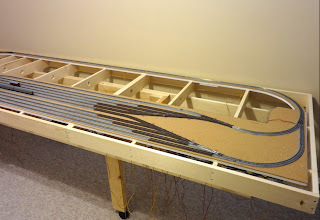 The first step was to lay down sheets of the 1/2 inch Gatorboard which would form the sub-roadbed. I then laid out the actual track on top of the Gatorboard and used a pencil to mark any cuts required. I used a sharp utility knife (I use the large 18mm, snap-off blades) with a metal ruler or straight-edge to make the straight cuts and a keyhole hand saw to cut any curves (a jigsaw would also work well) in the Gatorboard. With the utility knife it is important to realize that you are not going to cut the Gatorboard in one pass. After I had marked the cut, I scored the Gatorboard with a few passes of the blade. Once scored, you can then apply more pressure on a couple passes to cut through the top surface and into the foam center of the board. I usually put aside the ruler/guide at this point as the score line will guide the blade. Once through the foam, you will hit the hard lower surface. A pass or two of the blade with firm pressure will score this layer enough that you can then simply snap the board along the score line. before attaching with latex adhesive caulk. When cutting the Gatorboard I tried to make sure that where two pieces joined they did so across a benchwork cross brace so they were as strong as possible. Where that was not possible I used Weldbond glue to attach a smaller piece of Gatorboard as a reinforcing/alignment brace underneath. Once cut, I attached the Gatorboard to the benchwork with adhesive latex caulk (I used the 300ml / 10 oz tubes in a caulking gun). I chose adhesive caulk it remains soft and rubbery once it cures. This layer helps minimize the noise trains make by preventing some of the sound/vibrations from the running trains transferring through to the benchwork where it gets amplified. 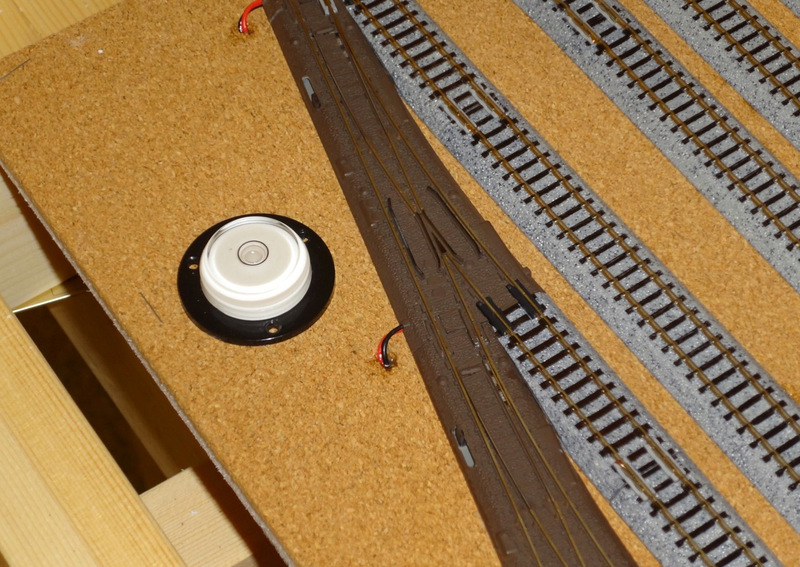 On previous layouts I used glues or construction adhesive and found that they dried hard enough that they increased the overall noise levels. through holes drilled into the Gatorboard. With the Gatorboard secured I then used the adhesive caulk to attach a sheet of 4mm cork (lay beads of caulk and then use a wide putty knife to spread the caulk to a very thin coat) to the top of the Gatorboard to help reduce the noise of running trains even further. The cork provides another layer to absorb vibrations and when the scenery above encloses the staging it helps quiet overall noise similar to the way carpet can reduce noise/echo in a small room. Home improvement stores typically carry inexpensive rolls of cork in various sizes and thicknesses. I then laid out the track on the cork and checked the alignment carefully with a metal straight-edge - this is important even with sectional track like Unitrack or Marklin C-track as there is a certain amount of 'give' in the joints. I marked the location of the track onto the cork and double checked I had all the electrical feeds and isolating Kato Unijoiners in the right places. Where the track crossed layout modules, I removed the piece of track and used a razor saw and small hobby mitre box to make a clean straight cut through the plastic roadbed and rails at the joint. With the track double and triple-checked I attached the track to the cork with more adhesive caulk (I used caulk that dried clear for aesthetic reasons). The Unitrack does come with holes that can be opened up to use nails or screws to attach the track but nails would not hold well enough in the Gatroboard and either would help transfer vibrations directly into the sub-roadbed, increasing noise levels. The caulk holds the track firmly and provides another layer of softer material to absorb vibrations and noise. I lifted sections of track off the cork, ran a thin bead of caulk along the center of my markings and flattened it out to a thin layer with a putty knife before replacing the track. At the module edges I used push pins to make sure the track prices stayed aligned while the caulk cured. Once the track was down (but before the caulk had cured) I pushed a test train of three silverfish coaches over all the turnouts and track to check for any problems. Next post - planning and building the helix using Gatorboard and Unitrack.